Fascism and white supremacy is as American as apple pie. One of the features of 2017 is older white liberals expressing shock at how illiberal America is. It’s easy to deride this realization, but it’s better than continuing to perpetuate the “he’s so well spoken” racism of the left. Perhaps it took Trump to reveal the rot that has always been at the core of this country. We are the sons and daughters of a liberal revolution—the spiritual brother of the French Revolution—yet we built an empire on the backs of slaves and on the graves of the natives. We founded a “democracy” on the fundamental precept that all men are created equal—except some who are three-fifths of a man—and also not women. For all its advances, America has forever been a rigged white man’s paradise. It just took one of our boy kings to ascend to the throne for many to see what’s been in front of us all along. The same structures which supported Jim Crow are still present today, and this uniquely American fascism has combined with the nihilism of Trumpism, creating a potent cocktail where most white voters in Alabama willingly favor an accused child molester over any Democrat. The media, myself included, likes to harp on the negative. The economy of clicks and eyeballs has proven that pessimistic and charged stimuli are good for business, so it’s easy to get caught up in the madness of Trumpism, because it seems to have completely flooded the Internet. But there is an entire world of people outside this digital space—and outside our political theater—who just want our public officials to represent the public. A child molester cannot, because it is a literal marker of societal decline. Thousands of purveyors of evil and its useful idiots tried to drive us to the brink last night. It wasn’t enough that Judge Roy Moore espoused views that people across the ideological spectrum derided as unconstitutional, but he also violated the laws of nature. To elect Roy Moore was to decide that because America has abandoned the law for the most powerful, the rest of us are not subject to it either. However, as mighty as evil may seem, good has slowly been winning the battle for centuries. Inch by inch. And it captured another inch last night. 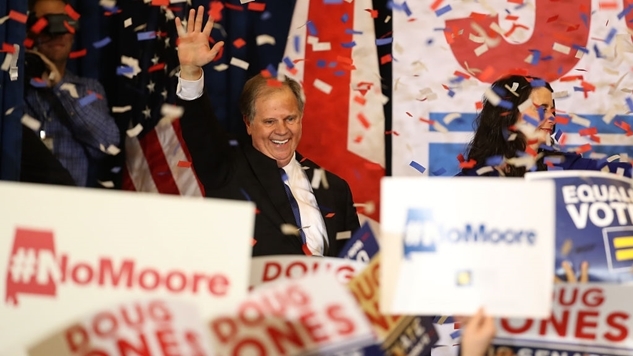 Doug Jones had no business winning this election. It’s an off-year race—not even mid-term off-year—in Ala-freaking-bama. To say this is a layup for the GOP is an insult to the skill it takes to get a basketball up to the backboard. This is as if the Republicans had no hoop at all, and simply had to bounce the ball on the floor. Instead, they threw it 15 rows up into the stands. Democrats haven’t held a Senate seat from Alabama in 20 years. They currently occupy eight of 35 state Senate seats, 33 of 105 in the Alabama House, and they comprise one out of Alabama’s six representatives to the United States House of Representatives. Under normal circumstances, this election would have been a cakewalk for the Republicans, but we don’t live in anything resembling a normal world, and 2016 may have initiated a tectonic shift in American politics. We are officially in a wave, my friends. Donald Trump has revealed the true face of the Republican Party for all to see, and those who usually muddy the waters have vacated their posts—upset that the Trumpists say the quiet part loud—and the waters are getting clearer. People are seeing the rot at the heart of both of our political parties (but especially the GOP’s) and are doing something about it. Millennials are the largest generation ever, and we are getting far more involved in politics—helping to change the minds of those who have been duped into supporting American fascism in the past. There is hope, but only because people are demonstrating the resolve to show up and get involved. Stay hopeful. Stay focused. But most importantly, stay active. If our generation is going to change the world, we’re going to have to actually change it, and last night in Alabama is just the start.